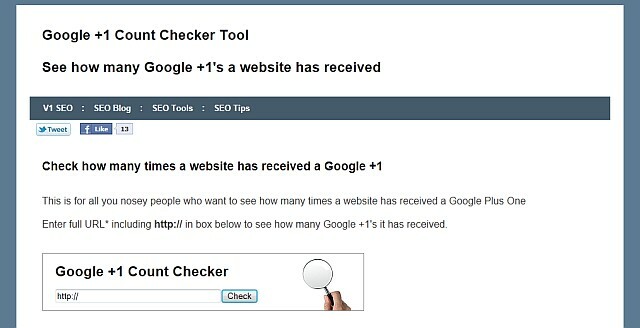 With Google+ and the Google +1 button attracting more debate as to whether they will effect organic listings in the SERPs, V1 SEO have updated their Google +1 Checking Tool to make it more user friendly, easier on the eye and quicker to use. As more people appear to be wanting to know how many google +1’s a website has received increases, the +1 Count Checker is being used more and more has now checked over 10,000 URL’s to see how many Google Plus Ones they have. A trend we are noticing is that some people are checking URL’s multiple times and sometimes coming back and checking again on other days, we suspect one reason for this is that they are either people who are selling Google +1’s, people using the V1 SEO Google +1 Button Checker to increase their Google Plus Onecount or just automated systems looking for ways to increase +1 counts. If you find a web page with a higher Google +1 count please let us know. * The Google +1 button measures individual URL’s rather than websites.